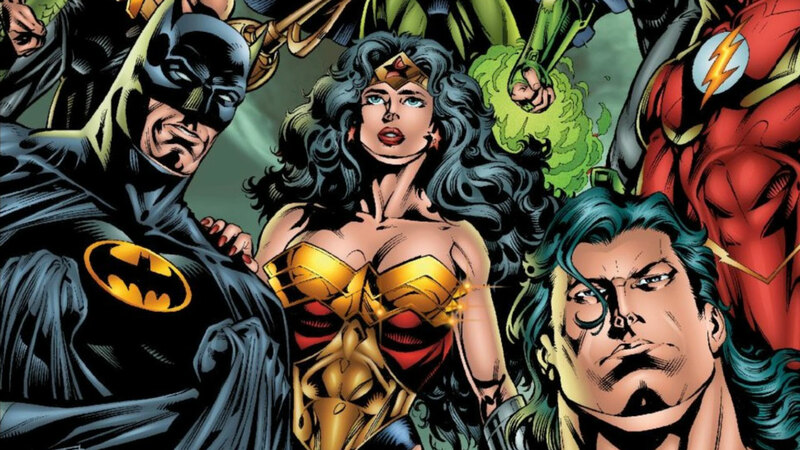 Is Grant Morrison's JLA the Definitive Justice League Comic? The Justice League of America wasn't the first DC Super Hero team, as that honor goes to their forebears, the Justice Society of America (which first appeared in 1940's All-Star Comics #3). Nevertheless, when Superman, Batman, Wonder Woman, and the rest of DC's most popular Silver Age champions came together to form the Justice League (in 1955's The Brave and the Bold #28) they instantly became the most iconic team in comics history. And without their success, much of comic book history would have unfolded very differently. While many talented creators have chronicled their adventures, there's a case to be made that writer Grant Morrison and artist Howard Porter's JLA (the complete run of which is now available to read on DC Universe) is the team's defining moment. Even the greatest groups fall on hard times. And after decades as DC's supreme super team (in the Justice League of America comic), by the mid '80s the Justice League had become less popular than their former sidekicks, who comprised the Teen Titans, and the futuristic Legion of Super-Heroes. The prevailing thought was that the concept of the World's Greatest Super Heroes united just wasn't enough of a selling point. So the original League disbanded, and different iterations of the team were tried. Some, like the Justice League Detroit, didn't click with fans, while others, like Justice League International, proved wildly popular, resulting in spin-off titles. But without DC's "Big Guns," they seemed less like what many fans considered the "true" Justice League, and sales eventually tapered off. Enter Grant Morrison. The Scottish writer had already made a name for himself at DC, with off-kilter books like Animal Man, Doom Patrol, and the graphic novel Batman: Arkham Asylum. DC gave this scribe of the avant-garde the keys to the kingdom, and their most iconic heroes featured in one book again. The Justice League of old was reborn, though with a '90s flavor that set them apart from their original incarnation. In the fall of 1996, Morrison teamed with artist Howard Porter and launched JLA, and the DC Universe was never the same. In the months before JLA hit the stands, DC ended all its prior Justice League titles, like Extreme Justice, Justice League America, and Justice League Task Force. The "Big 7" were back, as Superman, Batman, Wonder Woman, Aquaman, and the Martian Manhunter joined forces once again, along with the newer incarnations of the Flash and Green Lantern (in Wally West and Kyle Rayner, respectively). The new team debuted in writer Mark Waid's limited series Justice League: A Midsummer's Nightmare, which set the stage for Morrison's new JLA title. The first four issues of JLA started thing off with a bang. In "New World Order," a mysterious group of alien heroes calling themselves the Hyperclan came to Earth, promising to fix the planet's problems in a way its superheroes never had. Suddenly, public favor was in support of the Hyperclan, while Superman, Wonder Woman, and the rest became yesterday's news. But it turned out the Hyperclan were really alien conquerors in disguise -- savage White Martians who had once wiped out the Martian Manhunter’s green Martian race. When Batman discovered the Hyperclan's true nature, he exploited their natural Martian weakness to fire, in one of JLA's most memorable panels. And again, the League saved the world. But Morrison and Porter were only getting started. Their next storyline involved an actual invasion from Heaven itself, and found Superman literally wrestle with the angel Asmodel for the fate of creation (in JLA #6 and 7). 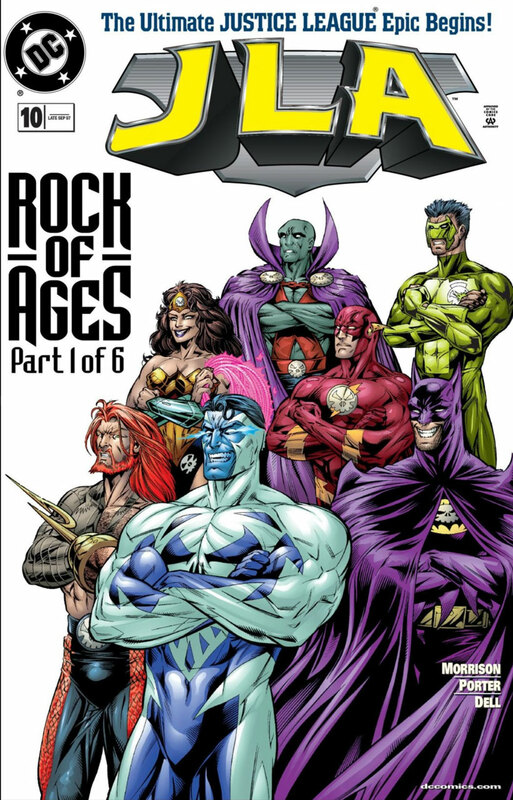 The first year of JLA ended with one of their wildest epics ever, "Rock of Ages" (JLA #10-15). This epic featured the Injustice League, the team fighting hard light versions of themselves, and Lex Luthor's hostile takeover of the JLA. "Rock of Ages" culminated with a journey into a future where Earth is ruled by Darkseid, and the League are the only ones left to take him down. After that, the League expanded, and began to truly reflect the Pantheon of Olympian Gods. They doubled their roster to fourteen members (in JLA #16). If Superman was now the equivalent of Zeus and Batman was Hades, then new members like Plastic Man represented Dionysius, and Barbara Gordon, then Oracle, represented Athena, Goddess of Knowledge and Strategy. This new "Olympian" JLA watched over the Earth from their own Mount Olympus, the Watchtower, on the surface of the moon. There, they fought a new villain Prometheus, an adversary designed to take them down one by one (JLA #17). The Morrison/Porter JLA run continued to grow bigger and crazier. The team encountered Daniel, the Sandman (in JLA #22 and 23), and later restarted the classic JLA/JSA crossover tradition in the epic "Crisis Times Five," a storyline that brought returned the Justice Society to modern continuity (JLA #28-31). After three years of non-stop excitement, Morrison and Porter capped their run with the 5-part epic "World War III", which pitted the entire League against their deadliest foe, Magedonn, the "Primordial Annihilator" who'd once destroyed the "Old Gods," and sought to destroy the new (in JLA #36-41). Their run ended on an exhilarating note, as every person on the planet briefly gained powers and became a Leaguer themselves to save the world. Morrison and Porter's run on JLA restored the League to its rightful place as the biggest superhero team published, and remains the benchmark for all modern Justice League comics. 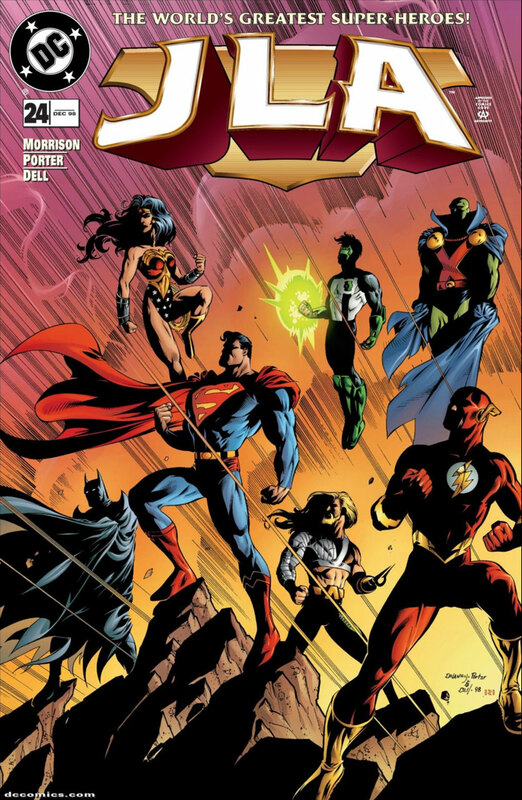 After this run, the League would rarely go back to not having DC's top heroes, an acknowledgement that when people see the words "Justice League" on the cover, they expect the best. The success of the title directly influenced producer Bruce Timm's Justice League and Justice League Unlimited animated series, which debuted a year or so after Morrison and Porter's JLA run concluded. Just like the comic, the animated team started out with DC's biggest heroes, then expanded to include almost everyone. Their orbiting space station was called "the Watchtower," a nod to the team's HQ in the comic. 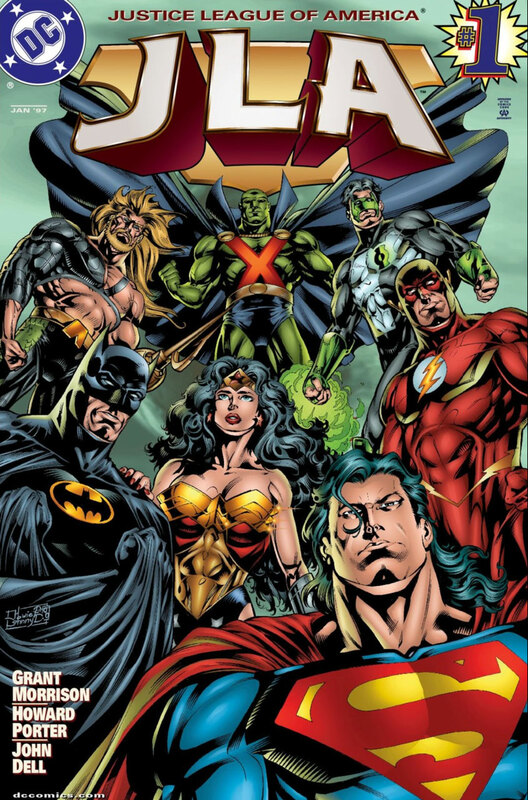 Even the animated film Justice League: Crisis on 2 Earths was influenced by Morrison and Frank Quitely's JLA graphic novel JLA: Earth 2, a companion piece to the ongoing series, in which the team take on their Anti-Matter universe counterparts in the Crime Syndicate. The wild imagination on display in this three and half year run, and its sheer commitment to raising the bar issue by issue, made Morrison and Porter's run on JLA one for the ages. Its influence is still being felt today. Are you a JLA fan? Let us know in our Community!